The first sign of trouble from Europe’s Schiaparelli lander came around the time the probe was supposed to jettison its parachute and fire thrusters to brake for touchdown on the vast equatorial plains of Mars, officials said Thursday. The spacecraft is feared lost after mission control lost contact with it less than a minute before landing Wednesday, when Schiaparelli was aiming to become the first European probe to successfully land on Mars. Built as a technology demonstrator, Schiaparelli was designed to validate a Doppler radar altimeter, sophisticated guidance and control software, and avionics systems that the European Space Agency intends to place on future Mars missions, beginning with a lander and rover scheduled for launch in 2020 developed in partnership with Russia. After its release Sunday from a carrier aboard Europe’s ExoMars Trace Gas Orbiter, which flew to Mars in tandem with the lander, Schiaparelli made an automated approach to the red planet and glided into the Martian atmosphere Wednesday at a velocity of 13,000 mph (21,000 kilometers per hour) for a fast-paced, six-minute descent sequence. The entry profile involved heat protection from cork and resin tiles, a European-built 39-foot-diameter (12 meter) supersonic parachute, and nine rocket thrusters mounted around the circumference of Schiaparelli in clusters of three. 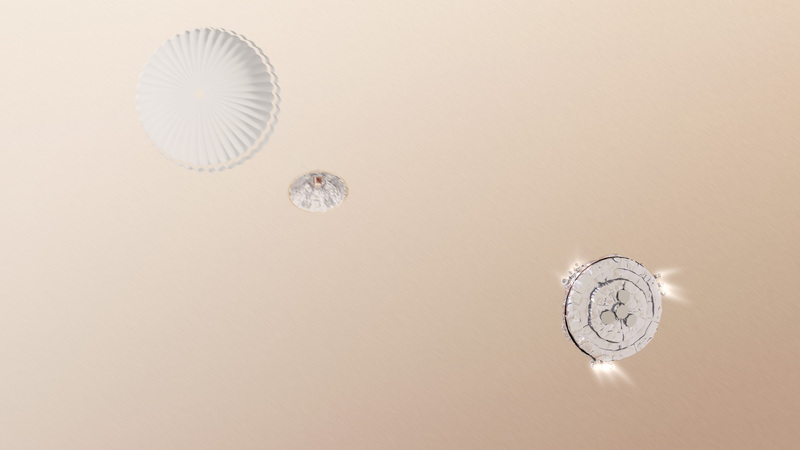 Something unexpected happened near the end of the lander’s descent under the parachute, when Schiaparelli’s back shell was timed to jettison and the probe’s thrusters were programmed to ignite. “All the EDM (Entry, Descent and Landing Demonstrator Module) has behaved according to our expectation up to a certain point,” said Andrea Accomazzo, head of the solar and planetary missions division at the European Space Operations Center in Darmstadt, Germany. “There’s a point where the parachute was released, and this is where the data we preliminarily analyzed from the EDM do not match, exactly, our expectations, and this is what we have to understand,” Accomazzo said. Officials said the separation parachute and back shell apparently occurred earlier than expected, and the lander deviated from the flight plan around the same time. The compact space probe was about the size of a Smart car, measuring less than 6 feet (1.8 meters) tall and around 5 feet (1.65 meters) wide after flying free of its heat shield. The robotic probe sent its last signal around 50 seconds before the expected landing time, Accomazzo said Thursday, and telemetry from Schiaparelli being analyzed by experts on the ground appears to show the spacecraft activated its radar and ignited its landing rockets, at least for three or four seconds. Stressing that engineers are still at a preliminary stage decoding the telemetry from Schiaparelli, Accomazzo said it was not clear whether all nine of the engines ignited or the altitude at which the thrusters cut off. The thrusters should have fired for 30 seconds to slow the lander’s velocity from more than 120 mph (200 kilometers per hour) to a walking pace around 6 feet (2 meters) above the Martian surface. At that point, the engines were supposed to shut down, and the lander was to fall to the ground cushioned by a crushable carbon-fiber shell. He said telemetry from all the lander’s systems provided “meaningful data” to engineers to unravel what happened. “Now it’s a matter to analyze why, when we put together this data in the Martian environment, the spacecraft didn’t behave exactly as we had expected,” Accomazzo said. Accelerometer measurements from Schiaparelli might indicate whether the lander made a hard touchdown before it stopped transmitting, officials said, and engineers will try to determine if the probe was descending much faster than predicted. Nevertheless, engineers are confident the answers are buried somewhere in the 600 megabytes of data received from Schiaparelli before it went silent. 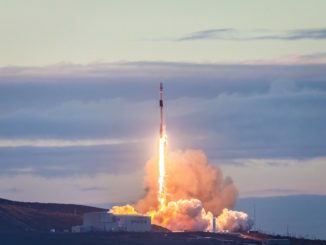 “The first analysis suggests that most of the steps required for the entry and descent were successfully completed, particularly the deceleration from 21,000 kilometers per hour (13,000 mph) at the top of the atmosphere down to having the probe suspended on its parachute,” said David Parker, director of ESA’s human spaceflight and robotic exploration division. 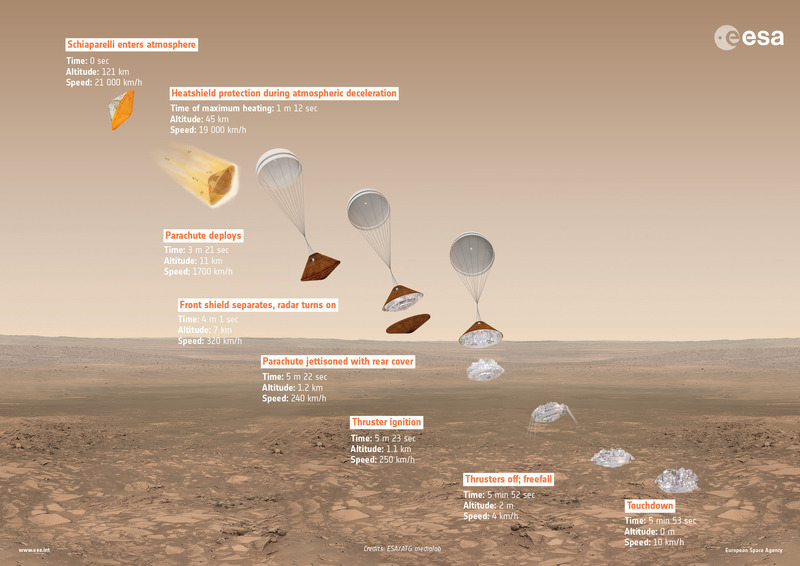 The ExoMars Trace Gas Orbiter steered into orbit around Mars at the same time Schiaparelli was entering the atmosphere, and a radio aboard the ExoMars mothership recorded telemetry from the lander until it stopped transmitting. Attempts to contact Schiaparelli since Wednesday have been unsuccessful, but officials said they plan to continue listening for signals from the lander for at least the next week. Ground controllers could also try sending commands for Schiaparelli to reset its systems in hopes the lander is intact on the surface. Before its arrival at Mars, Schiaparelli received pre-programmed commands from mission control to run through its surface mission without any help from Earth. The battery-powered lander, hosting a weather station, descent imager and a multitude of engineering sensors, was expected to function for at least four days on the surface, and perhaps as long as 10 to 12 days, McCoy said. “This lander was a test, and as we are always doing when we are doing tests, we put many sensors on-board,” said Jan Woerner, ESA’s director general. The sharp-eyed HiRISE camera aboard NASA’s Mars Reconnaissance Orbiter will try to spot Schiaparelli in a pass over the probe’s equatorial landing site in the next few days. If the American orbiter can locate the lander, it will only appear a few pixels across, and it might be difficult to glean insights from such an image. Officials Thursday highlighted the success of the Trace Gas Orbiter’s critical arrival orbit insertion maneuver, no small feat for ESA, which now has two active spacecraft circling Mars. There are a record six orbiters exploring Mars including Europe’s Trace Gas Orbiter and Mars Express missions, three NASA science stations, and an Indian spacecraft. The Trace Gas Orbiter and Schiaparelli launched together in March from the Baikonur Cosmodrome in Kazakhstan aboard a Russian Proton rocket to start the 300 million-mile (nearly 500 million-kilometer) journey to Mars. The tandem launch was the first of two planned under the auspices of the ExoMars project, a flagship exploration program led by the European Space Agency and Roscosmos, the Russian space agency, with smaller contributions from NASA. The second ExoMars launch is scheduled for July 2020 on another Russian Proton booster. 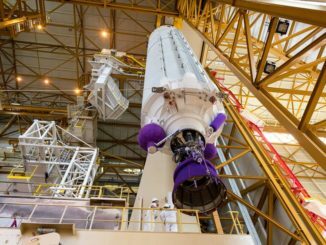 ESA and Roscosmos agreed to delay the launch from May 2018 earlier this year because hardware and science instruments would not be ready in time. 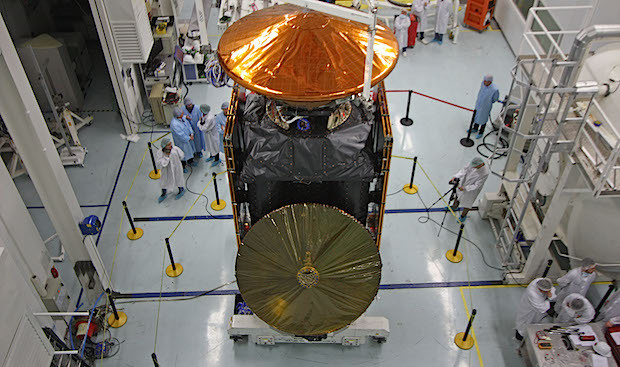 In addition to its scientific purpose of helping identify the source of methane in the Martian atmosphere, the Trace Gas Orbiter needed to be in place for the 2020 mission to help relay science data and commands between Earth and the lander and rover on the Martian surface. Methane could come from metabolizing microbial life forms or ongoing geologic activity — either source would be a major scientific discovery — and many researchers believe the only way to explain the trace levels of methane detected in the Martian atmosphere is if the red planet somehow regularly pumps more of the gas into the air. The top-level objective of the ExoMars program is to search for signs of Martian life, and the rover set for launch in 2020 will drill deeper into the red planet’s soil than ever before to look for biomarkers that could be shielded from damaging ionizing radiation present at the surface. But the problem encountered by Schiaparelli’s lander could cast a cloud over the 2020 mission, which will have the European-built rover and a Russian descent stage and stationary landing platform with computers and guidance systems supplied by Europe. Schiaparelli was intended as a smaller-scale, less expensive test of the technologies before putting them on the one-of-a-kind ExoMars rover mission. 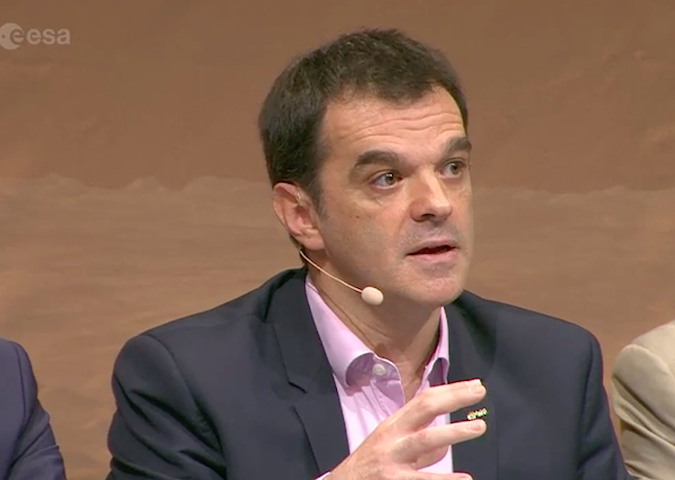 Parker said the data gathered during Schiaparelli’s descent will still provide lessons learned for the team working on the ExoMars 2020 mission. But ESA will have to present their case at a meeting of the agency’s member states in December when officials ask European governments for around $330 million (300 million euros) to make up for a shortfall in funding for the construction of the ExoMars 2020 rover. Italy is leading the ExoMars program, with Thales Alenia Space’s Italian division taking charge of all European industrial work, including the production of the Schiaparelli lander. Britain is ExoMars’ second-biggest financial backer, and Airbus Defense and Space’s factory in Stevenage north of London is charged with building the rover vehicle itself. NASA was originally ESA’s chief partner on ExoMars. The agencies had plans to send two rovers to Mars on the same mission, and launch the orbiter and rover packages on two Atlas 5 rockets, but NASA largely pulled out of the ExoMars program in 2012, prompting ESA to ask Russia to become a full partner and provide Proton rockets, a Mars descent system and scientific instruments. 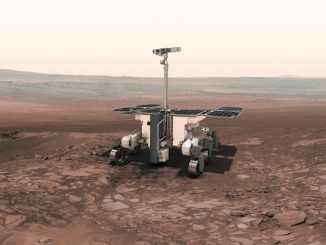 Woerner said the success of the Trace Gas Orbiter, and the lessons from Schiaparelli, should demonstrate to European ministers that the extra money for ExoMars is worth the investment. A review next week will determine exactly how much funding ESA needs to complete ExoMars, Woerner said. “The landing test still leaves us with some open questions we have to analyze,” Woerner said.